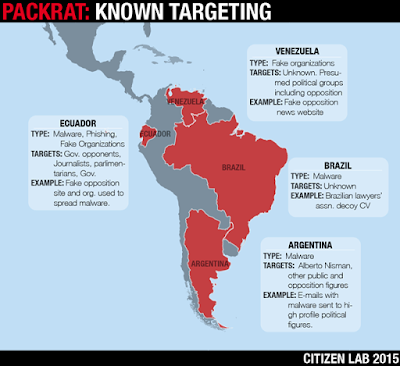 According to an extensive report by Citizen Lab, over the last seven years, state-sponsored cyber-attacks have targeted members of the political opposition and independent media in various ALBA countries, namely Venezuela, Ecuador, Argentina, and Brazil. "The report describes an extensive malware, phishing, and disinformation campaign active in several Latin American countries, including Ecuador, Argentina, Venezuela, and Brazil. The nature and geographic spread of the targets seems to point to a sponsor, or sponsors, with regional, political interests. 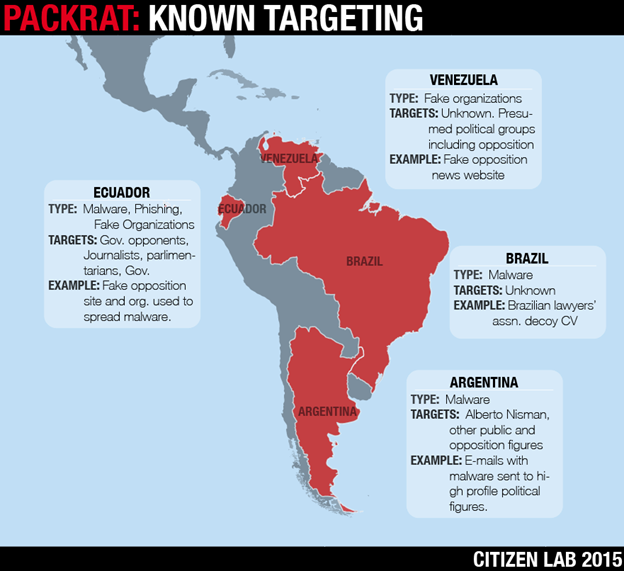 The attackers, whom we have named Packrat, have shown a keen and systematic interest in the political opposition and the independent press in so-called ALBA countries (Bolivarian Alternative for the Americas), and their recently allied regimes." The tie that binds this all together is the software and monitoring technology sold to these ALBA nations through Cuba's state-entities, Albet, Xetid and Datys. Albet, Xetid and Datys are software companies owned and operated by Cuba's military and intelligence services. They are linked to the University of Information Sciences (known as "UCI"), an entity created by Castro in 2002 to form the regime's "cyber-warriors." The UCI is located at a "former" Soviet espionage and communications interception base. In November 2014, we posted segments from a story in El Nuevo Herald, entitled "Oppression S.A., the new model of espionage and repression exported by Cuba." It describes how Cuba's regime is providing services to its regional allies, in order to spy, control and repress its citizens. This has become a multi-billion dollar business for Castro's regime, which has provided espionage, security and training services to its allies throughout the region -- but also monitoring technologies through state-entities, Albet, Xetid and Datys. Meanwhile, the Obama Administration -- and Castro's D.C. lobbyists -- absurdly argue that allowing U.S. companies to do business with these spy entities will "empower" the Cuban people.